Guitars arouse my crazy obsession, therefore, I am obliged to compile 5 top selling electric and electric/acoustic guitars for our readers. Guitar companies manufacture a wide variety and styles of guitars and sometimes produce junk that’s barely worth firewood, and other times produce the ultimate guitar that we can all appreciate. However, finding that perfect guitar is not always easy, but it’s fun searching for it. If you are one of those players that is searching for a guitar that provides that sensuous feel that fills your pulse with vibrations of rhythm and melody; yet easy on the wallet, then read on. We have been receiving innumerable inquiries from our Gear-Vault readers asking for help with making choices from the wide range of guitars available in today’s market. So I would like to talk about the 5 top best selling guitars currently on the market (not in any specific order). Ibanez AEL20 Acoustic Electric Guitar. First we’ll start off with the electric/acoustic out of the group, since it’s the only one we included in the this compilation. Everyone should have an acoustic guitar in their arsenal, right? The Ibanez AEL20 is one of the best electric/acoustic guitars that money can buy, and rightfully so, with it‘s modest price. This guitar boasts some nice features, with its SST preamp, Fishman Sonicore pickup and Onboard tuner. Ibanez didn’t slouch with the quality of wood either, it delivers a sensational quality of sound from its maple back and sides and flamed maple top. When amplified, the guitar produces the “twang and full bass but not as boomy as a Dreadnaught”. Gibson SG Standard Electric Guitar is also one of the best guitars that you can lay your hands on. This is the popular reincarnation of the original 1961 Gibson SG, which is a legend.. It has finger board made of rosewood and the neck and body is crafted from solid mahogany wood. The bridge is a Tune-O-Matic. The other features include: chrome hardware, 490R humbucker positioned in the neck, 498T humbucker positioned in the bridge, a 3-way switch with two knobs for tone and 2 for volumes. Schecter C1 Classic Electric Guitar is an extraordinary designed and crafted guitar. From its attention to detail to its top-of-the-line hardware, Schecter really based this guitar on their core value: unadulterated perfection. The C1 Classic is crafted from mahogany and a stunning quilted maple top, that helps give the guitar a deep crunchy tone. The neck is a 25-½” scale with a rosewood fretboard. The fast neck is complimented from its 24 jumbo frets. Did we mention this guitar is built with the top-of-the-line hardware? The C1 Classis boasts Grover Tuners, TonesPro locking bridge and Seymour Duncan humbuckers (JB at the bridge, SH-2N Jazz pickup at the neck). Musicians who play this guitar get multiple variations of tone, because of the 5-way pick-up selector with tapped humbuckers. Epiphone Les Paul 100 Electric Guitar is a popular economical product that may not be for the professional player, but certainly this axe has always been creating waves in the hearts of music lovers that admire the looks, sound and feel of the classic Gibson Les Paul. However, this guitar is not beyond their reach. The Epiphone Les Paul 100 has some of the great features of the classic Gibson, such as rosewood fret board, pair of humbucker pickups, Tune-O-Matic bridge and single cutaway body. Speaking of the body, it is made of alder; a lighter economical wood than mahogany. Some models also feature the mahogany body and neck, but you‘ll have to ask questions or read their product description to make sure you find the mahogany version. Other features include: chrome hardware, 24.75 in. scale, bolted-on neck. American Deluxe Strat Series. If you are looking for that traditional look and feel of a classic Stratocaster guitar with a little extra “oomph” under the hood? Then read on, because the American Deluxe Series Strat gives you all that and more… Featuring an alder body, three new Samarium Cobalt Noiseless Strat pickups, Fender’s S-1 switching system and a 2-point synchronized tremolo with stainless steel saddles – this guitar is built for speed! Its modern C-shape maple neck has a satin polyurethane finish and is available with a rosewood or maple fingerboard, abalone inlays and 22 medium jumbo frets. There are hordes of other awesome features, so you’ll definitely want to take a closer look at this model, oh, and it includes a hardshell case. Now have your pick and buy the axe that fulfills your passion. Be sure to stroll around Gear-Vault to do more research. 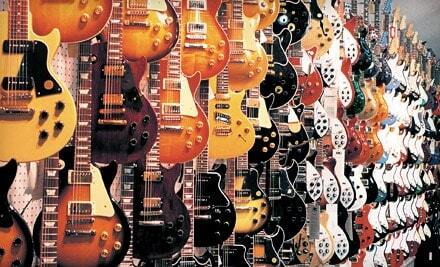 There is literally thousands of killer guitars out there just waiting for you to play. Good luck, and have fun with your venture. Decide Which Electric Guitar To Buy? My cousin has the acoustic/ electric Ibanez, and I played it @ a 4 the of July party. Well I have to disagree with the sound quality, it was really bad and string G wouldn’t stay in tune after one song. The wood quality is there and it had a set of Cleartone strings 2 weeks old. He also had a seagull and that was great.